Hurricane Arthur will hug the East Coast this holiday weekend. Arthur becomes a hurricane. Homeland Security steps up airport security. And the U.S. Navy has its first female four-star officer. 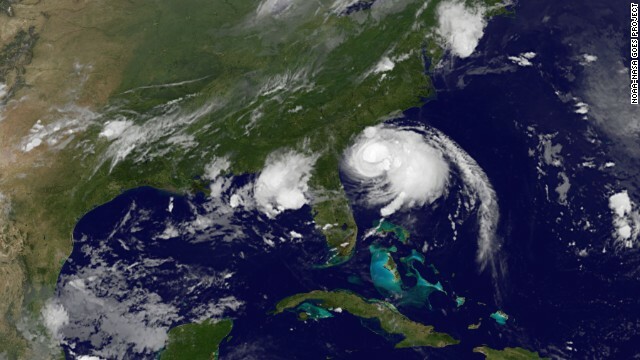 Getting ripped: Arthur's not expected to be much of a hurricane, but the storm could still mess up plenty of Fourth of July celebrations as it skirts the East Coast the next couple of days. Blustery winds and rain will do that. Folks are being warned to stay out of the water, because the offshore system is expected to generate potentially deadly rip currents, which could pull swimmers out to sea. New intelligence: Homeland Security is stepping up security for some flights headed to the United States from Europe and the Middle East. The measures do not involve U.S. domestic flights. It seems terror groups are getting better at making explosives that could slip through security more easily. Passengers could see added shoe inspections and closer explosives screening. "This is an invasion": The folks of Murrieta in Southern California took federal authorities to task last night over the issue of illegal immigration. "This is an invasion," said Heidi Klute. "Why isn't the National Guard stopping them from coming in?" Earlier this week, protesters forced buses carrying immigrants to leave the town. They were bused from Texas because processing centers there are being overwhelmed. Escalating violence: The death of a Palestinian teen in Jerusalem this week further inflamed tensions in a region already unsettled over the killings of three Israeli teens. Israeli authorities are investigating to see if it was a retaliation killing. Violence abounds. Rockets are being fired from Gaza into Israel. The Israelis are responding with airstrikes. Climbing the ranks: The U.S. Navy has promoted Vice Adm. Michelle Howard to admiral, making her the first female four-star officer in the Navy's 236-year-history, the White House said. Howard, who was the first African-American woman to command a Navy ship, will become vice chief of naval operations, according to her online Navy biography. - World Cup: Team USA captain Clint Dempsey and superhuman goalkeeper Tim Howard get props from Sports Fan in Chief Barack Obama. - Bang your head: Heavy metal construction. Keep some Tylenol handy. - Mind bender: This is what the Psychedelic Era was like, kids. Ask your grandparents. - Dog days: Just because there's no snow doesn't mean they're just kicking around at the dog park. These 17 German sled dogs are staying in shape for winter.